In August 2002, Edition 037 of The Paper published the article "Australian refugee action groups: shifting game positions" by Project SafeCom's Jack Smit. 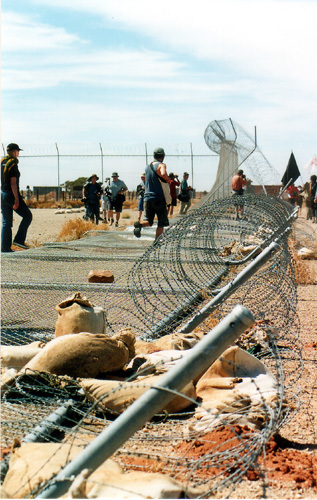 The article responded to allusions by Immigration Minister Philip Ruddock, that if anything happens to those who escaped from Woomera, advocates could face murder charges. The Paper is a small online publication that also prints in certain regions in Australia - and it's facing "extinction", so we're stored a mirror copy of the article on our website. You can find it here. While it is a short article, it's still on our website because it was the first public statement by Jack Smit for Project SafeCom, and it can also be seen as a personal declaration of intent: the stakes were raised considerably by Minister Ruddock with the remarks. The time may have come for refugee advocates in Australia to reconsider their positions in the human rights landscape following the latest statements by Immigration Minister Ruddock on the June 2002 Woomera breakout. The recent breakout may have been spontaneous, like the breakout at Easter, but it was also botched. Several refugee groups quickly distanced themselves from those who were part of this event, regardless of whether the Minister of Immigration chooses to recognise this or not. But with what could have been interpreted at the time as impending deaths - no matter how the government may seal access to the Woomera facility or information about what happens inside - I feel quite mild towards those who went to Woomera with a collection of vehicles, beeped their horns at the detainees in the middle of the night and tried to show some kind of sympathy. The Dutch did a better job during World War II. Thanks to a flourishing resistance movement, connected across other countries, such as France and Belgium, thousands of Jewish families found a home in haystacks, chicken coops and hidden spaces in some of Holland's stately mansions. Some of these families were freed from prison facilities where they were waiting for the death trains bringing them to Auswitz, Treblinka and Bergen-Belsen. Australians are far less connected to the dramatic past of the Second World War than their European counterparts, and consequently their European immigrant families. The events, which marked the world, left an impression of archetypical proportions on all Europeans, and sometimes the immigrant in me accuses Australians, who were born and bred in our beautiful country, of ignorance and an appalling lack of education in an attempt to explain what I sometimes see as a corpse-like apathy about politics, politicians and government decisions. And since my personal involvement with the asylum seeker and refugee movement in Australia started last year, I notice a similar absence of knowledge of the UN Refugee Conventions in the debate about the Howard government's policies: most talk about the issues without ever referring to what Australia really should take for granted: a firmly committed government position to honouring all aspects of that Convention. Without this aspect of the refugee debate, the issue is merely a tug-of-war between compassion and State sovereignty - and the Howard government is well aware of that. Thanks to this absent element in the consciousness of Australians they won a third term of office, and they keep the true obligations of Australia to the UN Convention well hidden. Australia was not brought to the brink of experiencing a nightmare in which the demons told its inhabitants that its national character, its art and literature, its freedom of speech, its freedom of association and its expressions of democracy would no longer be allowed. This may explain why currently human rights abuses of the proportion we see under the Howard government can take place without a major revolution by a majority of citizens. A small number of Australians played a major part in the underground movement in Europe during the War. One of those was Nancy Wake, who under her operative name of 'White Mouse' became one of the most respected figures in the underground movement. But when I read about Nancy Wake's relationship with Australia I am reminded of my own fury about the Australian absence of that aspect, formed in the European psyche as a result of the war: already in her nineties, the White Mouse departed from Australia, vowing to never return. The failure of successive governments to join other nations in the western world to honour those who were central figures in WWII's underground movement is clear evidence of this absence in the development of the Australian psyche. It may well be the reason Australia now faces the issues in a hideous way; it may well be the reason a government of extremist proportions stays in power, deluding its voters with the 'law and order' equivalent of 'border protection', meanwhile manipulating Australians by selling an interpretation of the UN Refugee Convention that cuts policy into two halves. With Ruddock trying to advance the plot by introducing allusions to murder charges for those who try to assist detainees to escape a situation which in the future, by an Australian court, may well to be found 'illegal custody', the scenario becomes more immediate. The secrecy surrounding what really happens in the detention centres is slowly being uncovered thanks to unrelenting pro bono work and resulting achievements of people like Julian Burnside QC and his partner Kate Durham, by a recent visit by Anne Coombs, co-founder of Rural Australians for Refugees to Christmas Island, and by Dave McKay and Ross Parry of the Woomera Embassy, to name just a few. Also through hard work by a growing number of doggedly determined Australians who insist on visiting detainees, and bringing to the outside what really takes place in the recesses of a sick government mind, as it is reflected by its hounds, Australasian Correctional Management. No matter how the Minister spins the truth, he is and will remain the 'primus inter pares' of refugee workers by virtue of the Crown in the Australian territories. As such, he carries full responsibility for the wellbeing of asylum seekers, approved or rejected as they may be. The growing number of refugee groups and alliances will hold him to that responsibility. But when deaths inside Woomera seem more likely than ever, more and more Australians are likely to stand up and be counted. It is to be expected that a great number of people will support and also initiate breakouts and create an elaborate network of sanctuary places where escapees will be hidden after having been whisked away from environments where human rights abuses are the order of the day. Nobody else can be made responsible for these acts of kindness than the government, which created the conditions for these human rights abuses to occur in the first place. Either the government changes its policies of devastating oppression and human suffering or decent Australians will become prisoners of conscience.